Rooms look out over the Brisbane River, with some in touching distance to the cliff-side. Brisbane’s Howard Smith Wharves precinct has opened the doors to its newest hotel, with Accor this week welcoming guests for the first time to ‘The Fantauzzo’ in the city’s new cultural hub. Inspired by Australian artist Vincent Fantauzzo, the $100 million, six-storey hotel has been carved into the cliff underneath the city’s iconic Story Bridge. 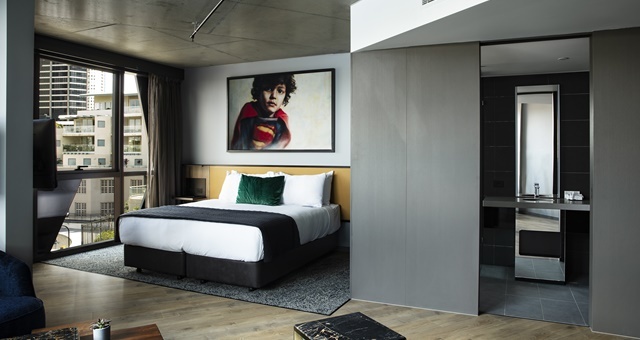 It offers 166 suites overlooking the Brisbane River, with the property peppered with giclée prints and six original artworks reflecting the style and personality of the namesake artist. Guest facilities include an Italian restaurant on the ground floor, rooftop pool and bar, fitness centre and function rooms. While staying in-house, guests can take advantage of complimentary art tours, in-room art-themed TV channels and libraries of Fantauzzo’s work to explore and appreciate. “It’s very exciting that we can finally share this stunning property, the first Art Series hotel to open under our management, with guests visiting Brisbane from other parts of Queensland, interstate and overseas,” said Accor COO Pacific, Simon McGrath. The Fantauzzo can be found at 5 Boundary Street, Brisbane.